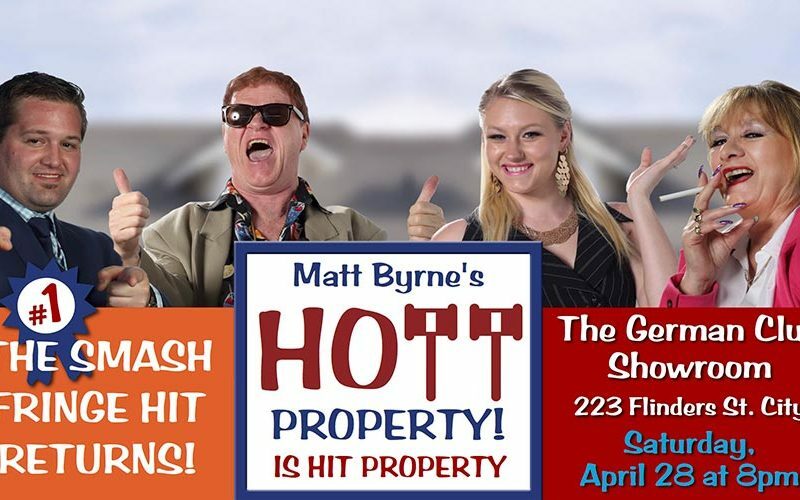 The riotous real estate comedy which ran for five fabulous weeks at Maxim’s Wine Bar at Norwood, had critics and audiences in stitches, and real estate agents lining up to see their industry go under the hammer! Producer/writer/director Byrne said he was thrilled to be bringing the show to the German Club after his hit Fringe season. 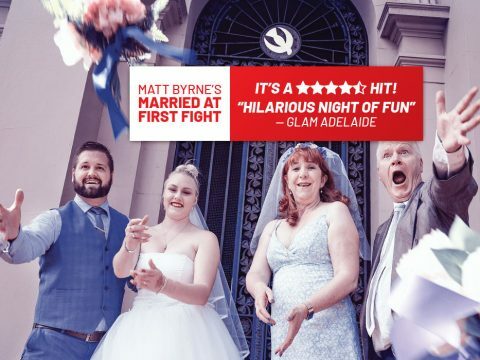 “Hott Property really struck a few home truths with audiences and the German Club Showroom is a fantastic venue,” Byrne said. “And audiences lapped it up! We were the No. 1 comedy on www.talkfringe.com.au so the punters were very happy. 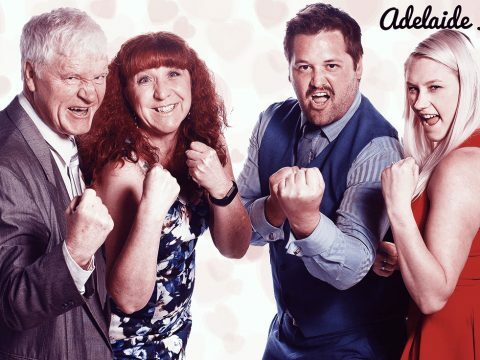 Hott Property follows the antics of dodgy real estate agent Red Hott, his world-weary wife Smokin’ Hott, their blonde bombshell daughter Pipin’ Hott and her ambitious fiancé Terry Trott, as they try to find the right property for four outrageous couples in the Hott Property Family Challenge! “There’s song and dance, quick character changes, gags galore, plenty of crowd involvement and inside information about the real estate game,” he says. “We have a fabulous cast with Theresa Dolman as Smokin’, Amber Platten as Pipin’, Brad Butvila as Terry and myself as the redoubtable Red. 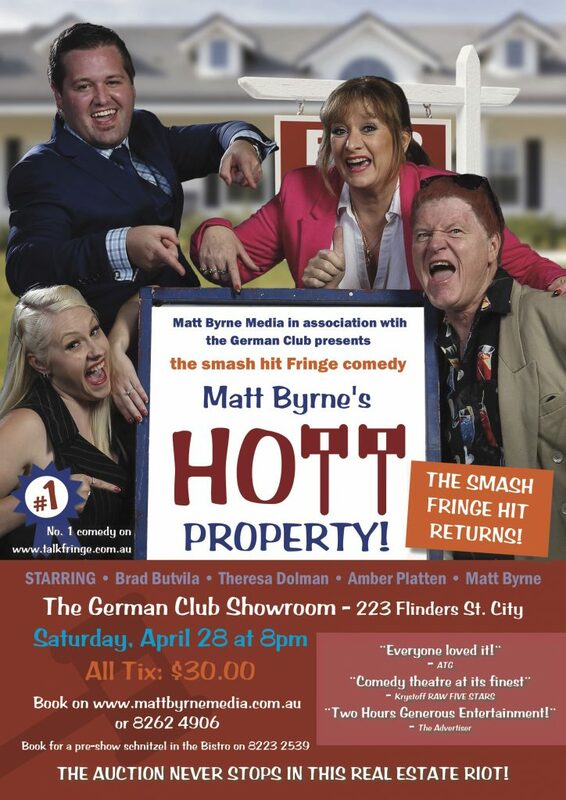 Matt Byrne’s Hott Property will play The German Club Showroom at 223 Flinders Street, City on Saturday, April 28 at 8 p.m. All Tix are $30 and bookings are available on 8262 4906 or by clicking here. 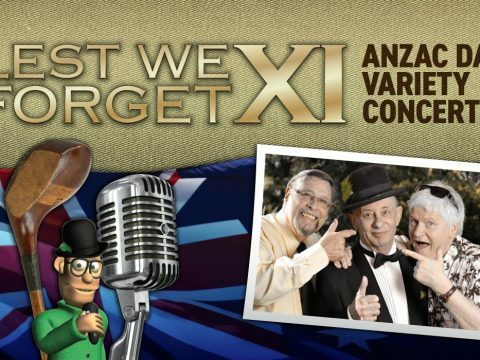 Ring 8223 2539 to book for a Schnitzel in the downstairs Bistro before the show.